Shirley's Newest CD is HERE!!! CONCERT IS FREE AND OPEN TO THE PUBLIC ! Donations accepted !!! NOT JUST OOM - PAH! ACCORDION WORKSHOP! $175 for Accordionists. Includes all materials & Lunch each day. $60 for Non-Accordionists. Includes Lunch each day. One Lucky Young Accordionist will be offered a Workshop Scholarship! Free & Open to the Public. All Ages Welcome! Donations Welcome! Workshop Participants join Rachel Bell & Karen Axelrod in playing for Dance Session. Dances taught by Gaby Thompson. Nick Ballarini will be at Workshop and Folk Dance Session for all your Accordion and Accordion Accessories needs. Shirley is now teaching accordian lessons! To study with Shirley, contact her at 512-680-0422. Lessons are taught in Austin, Tx. 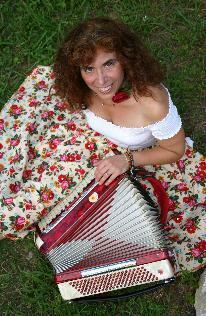 A fun, lively, and personable entertainer with a lyric voice and a sparkling accordion! as well as other International and American folk music.